The monounsaturated fats, protein, potassium, and vitamin E that almonds have reduces the risk of heart diseases. You may think almonds will make you gain weight due to their fat content, but the fat they contain is unsaturated. This is good, natural fat, which fills you, making you less likely to reach for a candy bar or something junky later. The dietary fibre in almonds also contributes to a full-stomach feeling, and helps maintain consistent bowel movements and prevents constipation, leading to a good-working system that isn’t holding onto fat but is being consistently cleaned-out! When your body is too acidic, you can experience low energy, weight gain, poor immune function, and develop osteoporosis. Almonds counteract these symptoms because they are alkaline. Almonds release energy slowly and keep you boosted throughout the day because they contain manganese, copper, and riboflavin. Vitamin E – eliminates free radicals. Free radicals cause damage in your body. Studies have shown that people are less likely to get heart disease if they consume high levels of vitamin E.
Calcium and Phosphorous – help keep your bones and teeth healthy. Just make sure you’re getting enough Vitamin D, which will allow your body to properly absorb these minerals. We need to get our fatty acids from food because our bodies can’t create them itself. Almonds contain healthy fatty acids – linoleic and linolenic (see below, Anti-Inflammatory, for more info). The folic acid almonds contain helps reduce birth defects and stimulates healthy cell growth and tissue formation. 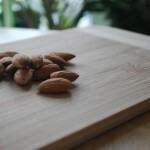 Almonds are actually stone fruits related to cherries, plums and peaches.